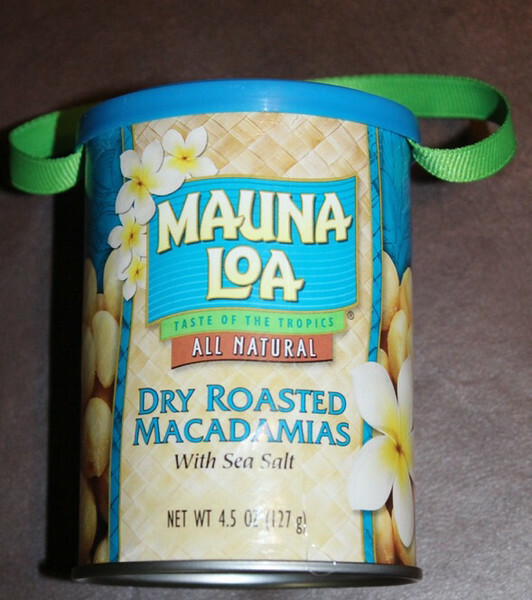 We were able to go to Hawaii in August and one day we stopped at the Mauna Loa macadamia nut factory. It was a quick stop, but we made the most of the sample station. The kids enjoyed the samples, but Keaton really enjoyed walking by the windows and watching the workers prepare the nuts. When we passed the chocolate room, Keaton exclaimed that she wanted to work there when she grew up. I told her that we would come and see her often. I am sure that pay wasn't too good but if you are happy then that should make up for it. Now, I know that hanging a can of macadamia nuts on your tree is probably not a proper ornament, but neither are the other things I have on the tree like a syrup bottle, can of spam, a shoe and the list of crazy things just goes on. Click here to see us visiting where Keaton will be working when she grows up.